This was another enjoyable and successful event. Our volunteers came out once again and bag packed for these five days leading into Christmas. We were well received by customers and staff as this is the busiest time of year. We really enjoy ourselves. The supermarket is delighted with the help. We are tried and tested at this stage. This is our eight Christmas Bag Pack. We have built up a good relationship with the supermarket management. This is mainly due to the constant loyal willing volunteers who join us every year. Sincere thanks to all. Delighted to say we raised €9,182. Huge thanks to all Super Value’s generous customers. This annual event was enjoyable and successful. We had twenty tables on the night and the craic was mighty. We raised a total of €530. Sincere thanks to all who participated and particularly to the Quizmaster Michael O’Brien who gives his time and expertise voluntarily. The table quiz was our Charity’s first fundraiser and this was our ninth one. This year’s Pony and Trap Drive was a tour of South Kilkenny. Billy Meany and his entourage of five ponies and traps left The Thatch Pub at 12 noon, going through Mullinavat, Mullinarrigle, New Ross and back to The Thatch Pub. There was a pitt stop at The Rhu Glenn, Slieverue en route for the ponies and their drivers. This was the fifth year of the Pony and Trap Drive. The total amount raised on this wonderful day was €3,959. Thanks to Billy and his team and all who supported us. The ladies and Michael participated in the mini marathon again this year. This is an enjoyable annual event. Brian and Ursula Corcoran from Dungarvan, County Waterford and their extended family, joined us in the mini marathon. We had a fantastic day and the weather was really hot. The total amount raised on the day was €2,074 — €1,571 of which was raised by The Corcoran Family. Sincere thanks for participating and their generous sponsors. The day was a great success. The weather just about held up. It was very windy with showers in the morning. The showers eased off as the morning progressed. Sixteen teams took part on the day. Everybody enjoyed themselves. 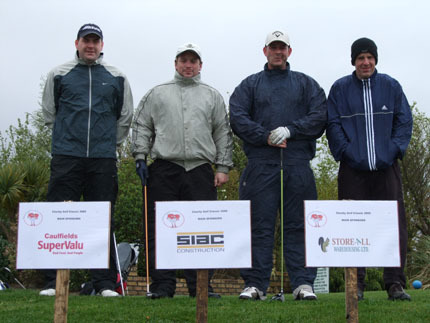 We held a raffle on the day with 17 prizes varying from green fees to meal vouchers etc. The food was superb and the service provided by Mountain View Golf Club was exceptional. We appreciate the generosity of all our sponsors and teams who played in the Golf Classic. The total amount raised to date is €9,597. 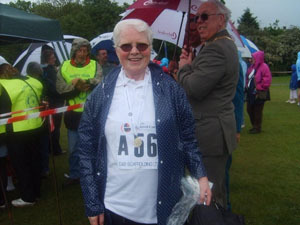 Sr Philomena Purcell participated on behalf of Marfan Syndrome Research for the fifth time this year. 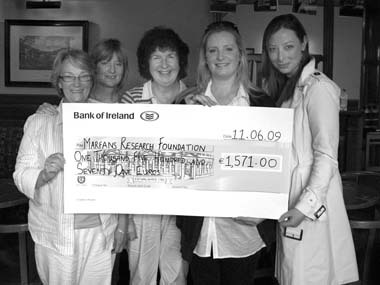 Philomena raised the incredible amount of €1,166 on this occasion. Philomena’s total tally for the five years is €4,545. Sr Philomena celebrates her golden jubilee as a Catholic Ursuline Sister on 9th August 2009. Congratulations Philomena and continued good health and happiness to you. Jennifer Kearns, Paul Kelly, Michael Tobin and Edmond Purcell organised this fun filled and successful event. The entertainment was brilliant from start to finish. Michael Tobin, Edmond Purcell and Eddie Dan had their beards shaved. Nicky Doyle, Edmond Purcell and Padraig Butler had their legs waxed – oh the pain!!! There were plenty willing volunteers to do the waxing. Paul Kelly had his underarms waxed. Paul was stoic with his high pain threshold. 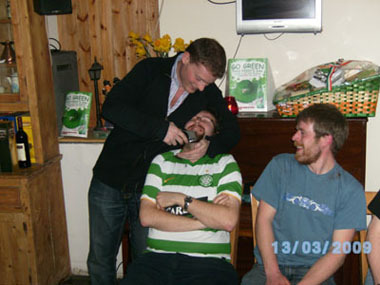 David Ryan, proprietor of The Thatch Pub volunteered to have his chest waxed if he got sufficient sponsorship. This brave deed raised €120.00 alone. The brilliant music was provided by Cathy Purcell and her band Shikaka. The patrons of the Thatch were enthralled with this magnificent girl band. The No 1 M.C. on the night was Pilot Conway who entertained us all in his own inimitable way. Pilot sang a few songs as also did local man Eamonn Hayes. Great credit is due to Michael, Jennifer, Paul and Edmond who organised the whole event. The amount raised was an incredible €1494. The information evening was very successful. Doctors John and Jonathan gave an interesting and informative presentation on Marfan Syndrome – how it manifests itself and an update on the current research in Ireland. Dr John Byrne told us how he represented Ireland at a medical conference in America which was attended by over 30,000 delegates from all over the world. He spoke about the progress of marfan research in Ireland. Dr John explained that Ireland punches well above its weight considering the size of our country and the resources available to us. Dr Darren Mc Laughlin has joined the research team in Ireland. Dr Darren spoke to people individually explaining the current research. The doctors expressed their sincere appreciation for the funding they receive from The Marfans Research Foundation. They said the research results are promising and the future looks good for all marfan sufferers. 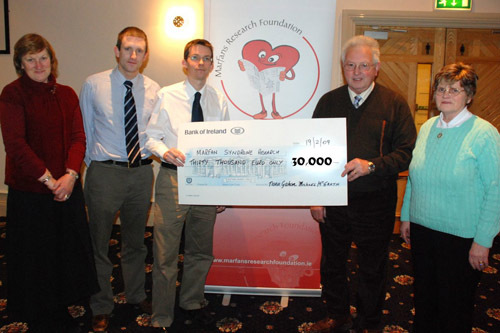 A cheque for €30,000 was presented to the doctors for marfan syndrome research.